Our Penthouse-level ocean front studio is remodeled, personally decorated, and complete with all the amenities you expect for a relaxing vacation. We offer all the comforts and conveniences of an island home, as we ourselves have been renters on Maui and know what is expected to make a memorable vacation. Our condo comes with a fully equipped kitchen, an entertainment center with TV, DVD, VCR and CD player, a computer with free high speed DSL internet connection for e-mail & games (plus photo editing software for perfecting any digital photo’s you want to send), plus many other amenities to ensure your vacation is a relaxing one. The condo has a queen size bed, as well another queen size pull-out. Keep your cool in air-conditioned luxury as you relax. The sensational sunsets, cooling tropical breezes and unparalleled ocean views of the islands of Moloka'i and Lana'i will create memories to treasure for a lifetime. Enjoy sitting on the lanai with a 180 degree view of nothing but turquoise water, blue sky, and the neighboring islands. During whale season, you'll watch in amazement as these gentle giants play right in front of your eyes. Maui Kai is located on the sunny West Maui coast, on world-famous Kaanapali Beach, just minutes from the West Maui-Kapalua Airport and the famous whaling town of Lahaina. Once the whaling capital of the world now the whale watching capital, Lahaina offers some of the finest shopping and dining in the Pacific. Kaanapali and Kapalua offer spectacular, world-class golf courses and fantastic snorkeling and swimming is available up and down the coast. For the daily necessities, there's a shopping center with a large grocery store nearby, plus on Mondays, Wednesdays and Fridays there's a local Farmers Market just minutes away by foot. At Maui Kai’s private recreational facility, you can dive into the pool or relax in the Jacuzzi. It's there that you'll also find gas barbecue grills for easy island-style cooking, an enclosed cabana with complete kitchen, ping-pong table, and just in case you forgot your bestseller at home, a lending library. This condo was everything we expected. We enjoyed sitting on the lanai watching the sunset and listening to the ocean after a long day of exploring Maui. This 10th/top floor condo had all the things we needed for our 1 week stay. I have to admit I was a little concerned about the murphy bed not being comfortable, but we were pleasantly surprised that it was very comfortable and we slept very well. When we arrived, the condo was clean and ready for our stay. During our stay, Christine was very helpful and answered questions very quickly. The Kaanapali beach and the paved walkway that runs along part of it, is just a short walk away. We could walk to various resorts, shops and restaurants along the walkway and there is a strip mall across the street with a few shops, restaurants and a full-sized grocery store. The condo complex was quiet despite being right next to a large resort (Kaanapali Beach Club) and a bit windy outside of the door. These sounds were not an issue inside the condo unit itself and it was as if we had the whole place to ourselves. The grounds of the condo complex were well kept and the front desk staff were very friendly and helpful. The pool is small but never crowded. There's also an outdoor kitchen that includes gas grills, full kitchen, and tables is very nice. 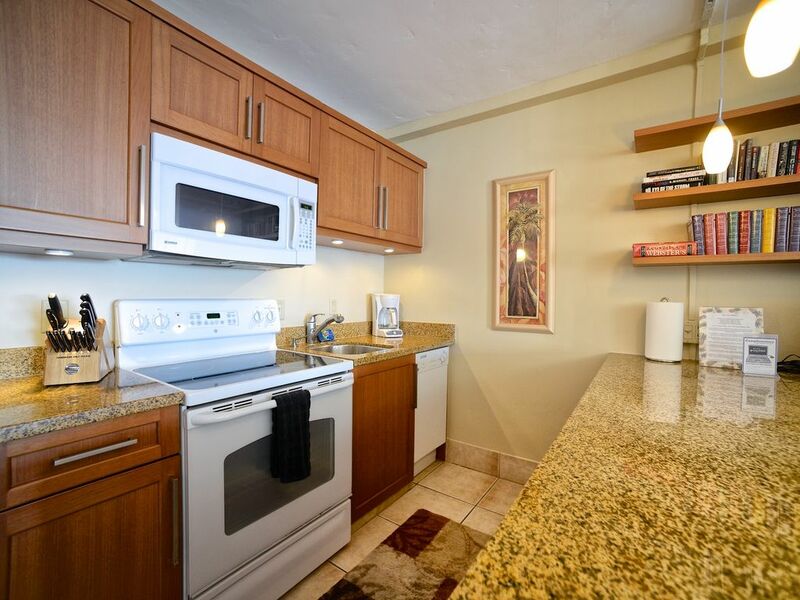 Mahalo Christine for the use of this wonderful condo! Great view, but otherwise just okay. We were disappointed with this condo choice. The condo is immediately off the elevator, and due to location- was in an extreme wind tunnel. Inside it sounded like there was a tropical storm outside the door! Inside, you can see how dated things are- vents, paint all could use a serious cleaning/update/refinish. We also didn't realize the washer/dryer were coin operated- must have missed that in the description. Some pro's: the murphy bed was much better than we expected; the furnishings are all pretty nice and up to date; the kitchen is well stocked; the view of the ocean is wonderful and the lanai is great to spend time on. Obviously if you are in paradise, you don't spend that much time inside, so it's not the end of the world if things aren't perfect inside, but it just wasn't the right fit for us. My parents and I recently returned from a three-night stay here and all I have to say is Wow! The condo was just as I expected, but views from the balcony took my breath away. We very much enjoyed sitting there eating meals, watching the surfers and even saw whales. Didn't see them everyday, but one day there were maybe four out there putting on a show. The condo was so comfortable for the three of us and had everything we needed for a beach trip: chairs, towels and a beach hat. My parents also loved going to the pool/hot tub every morning; it's not as fancy as the other buildings but it was nice and quiet. We stopped by Costco right outside the airport for some food, but also bought groceries from the supermarket just across the street. We had dinner at Dukes (within walking distance) during sunset and also had a great meal at Star Noodle (Sheldon Simeon of Top Chef). Thanks Christine for a perfect stay! This place is a beauty at a great price. We saw turtles right off the balcony! Great location with walk-able distances to restaurants and shops. The boardwalk that runs along the beach that starts just after the condos was great and very convenient. It was nice to not have to walk near traffic but to enjoy the beach scenery instead. :) We enjoyed Java Jazz not far from the condo for coffee and breakfast and eating at Duke's nearby along the boardwalk is a must. We loved our stay in July 2016, although tropical cyclone Darby tried to upset our plans but over the 5 days we only had half a day of solid rain and a few days of strong winds. We loved the sound of the waves crashing on the shore and looked forward to going to bed to listen to the soothing sounds. We saw a couple of turtles from our balcony and saw quite a few snorkeling at the rock wall at Ka'anapali beach south of the Royal Lahaina. The condo was well equipped, great to have beach towels. The view was just amazing!! loved sitting out there after our morning walk and a takeaway coffee....yet to find coffee in Oahu/Maui which is the strength of Australian standards and got strange looks when asking for a quadruple shot in a small takeaway cup lol! The murphy bed was very comfortable and also the fold out lounge great for the other adult in our group. It's a 5 minute walk to a group of shops, there's a Safeway, Subway, Paradiso Pizza (delicious!) Snorkel Bobs and lots more. The local Bus also just in front of shops to Whaler's Village/then change buses for Lahaina. If looking to snorkel with turtles, most likely to find them straight from the beach at Napili and Kapalua. If looking to connect up with the beach walk footpath, you can access along the sand in front of Maui Kai if not high tide, otherwise it's a 10 minute walk the longer way round to the start of the walk to head South. It took us a brisk 35 min walk to Whaler's Village if taking shortcut on the sand (5 mins on sand to footpath). We love that this condo is in a quieter area, we found Whaler's Village just a little too busy and decided one night to celebrate my daughter's birthday closer to the condo at Duke's 10 mins away along the beachwalk path. My only suggestion would be another one of those neck pillows as we had a squabble over that LOL We'll be back, I prefer to be there for whale season, so hopefully February 2017 we'll see you again :D Thanks Christine Is there anywhere to post photos?